What is the purpose of the spring loaded trap door on the choke plate? I'm assuming it should be on the top when the plate is installed. Does the plate face the carburetor body or face the throat opening. Is it needed to be operational or could it be JB welded closed. I'm going to need to pull mine because it appears the spring is either broken or missing or detached as the door hangs down and does not choke the engine. 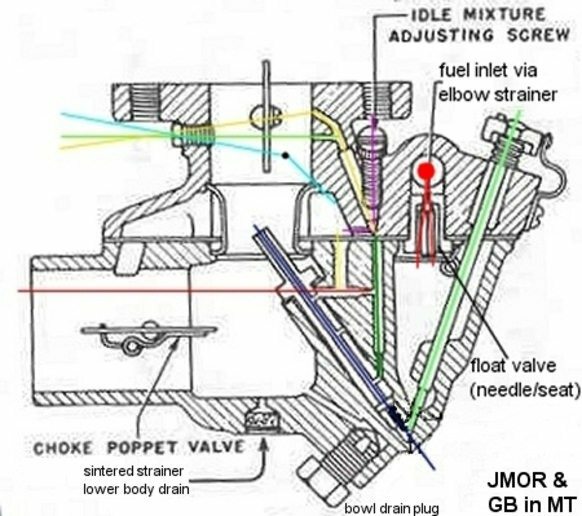 Is it best to remove the carburetor from the engine to R&R the choke. JB Weld it shut??? Really? You're joking, right? Why on earth would you want to do that? If the choke plate is installed backwards, you won't be able to open it at all. New complete carb kits have a new choke plate in them. I rebuild carbs all the time -send me yours and I will fix/rebuild it correctly. I have many used and new parts for these M/S carbs. 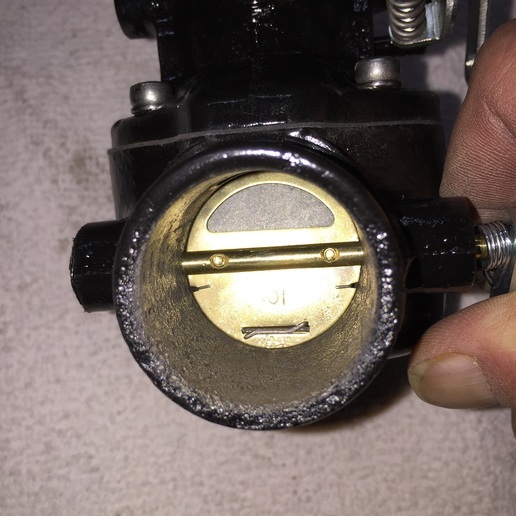 Yes, you do need to detach the carb from the manifold and work on it in the shop or kitchen table. Take pictures before you remove a part and mark it so you know what it is. I use a muffin/cupcake pan to keep parts in order with a piece of masking tape to label the pocket. Have a document on how to rebuild as a guide. "How do you send someone email on this board"
I sent you an email via the forum to make it easier. The spring holds the plate closed when you're starting it. flow pulls that plate open against the spring allowing enough air for it to run. I have dozens of those springs. If you need one I'll mail you one. Free. It looks like your choke plate is screwed onto the choke arm with the plate on the carb side. My plate is on the outside of the arm with the screw heads facing the throat of the carb. does that mater. The choke seems to close okay, except for the flapper door. How do you send someone email on this board, I could use one of those springs. Some carbs have a "backfire relief" in the choke plate, but these are the opposite... they are "choke relief", and the flap opens INWARD. Spring is readily available new, guess I'd take the carb off to install it, but it could probably be installed with the carb in place.